I managed to find my I2C OLED display when I was cleaning up my place. As I currently have a S3 storage cluster project ongoing, I figured now would be a great time to get it working so I can attach an OLED display to each of the Raspberry Pis so I can get their status on a glance. Below are the steps I used to get it working on Rasbian Lite. The steps should be the same for other distros. Connect the pins as shown in the diagram and using the description below. Vcc 1 Make sure to connect the OLED to the 3.3V power out ONLY. On Raspbian, type sudo raspi-config to enter the configuration options. Select Interfacing Options which will present further options. Select I2C and press ENTER to activate it. 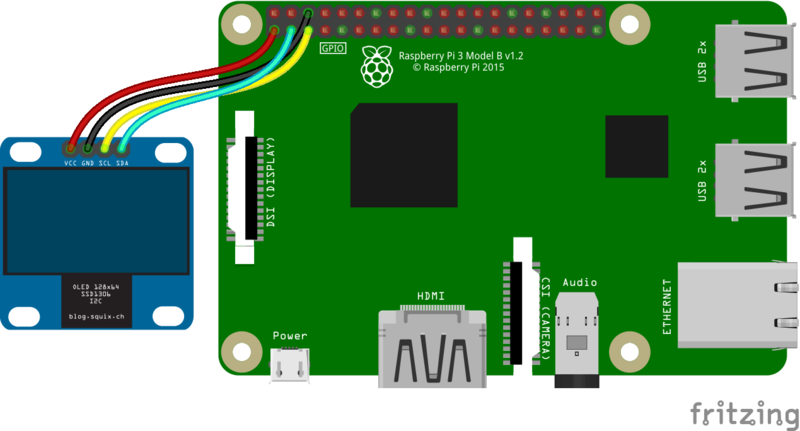 Reboot the Raspberry Pi to enable I2C. Notice the 3C. This is the hex address of the OLED. If something similar to this is shown, it means the OLED is detected and we can start using it. To verify the display was still functional, I decided to use the Adafruit OLED library to test it out. I did the following to get it working. If everything went well, you can now view the IP address and some other statistics on the OLED. My next step is to use Golang to develop an application that will display information on the Raspberry Pi for my S3 cluster. Until then, I hope this helps anyone looking to connect an OLED to their Raspberry Pi. Cheers! Note: I do not own the rights nor do I take credit for the images used in this post.